A Wisconsin prosecutor who tried to spark an affair with a domestic violence victim has resigned. The Associated Press reported last month that Calumet County District Attorney Ken Kratz sent 30 text messages to a domestic abuse victim while he prosecuted her ex-boyfriend on a strangulation charge. Gov. Jim Doyle began the process to remove Kratz from office about two weeks ago. His attorney said last week he would resign before this Friday. 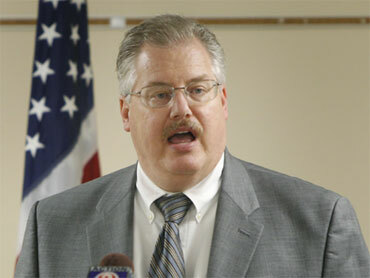 Kratz issued a statement to the media on Monday saying he has lost the confidence of the people he represents. He also apologized to his family for embarrassing them. A prosecutor facing removal from office over accusations that he abused his position in seeking relationships with vulnerable women will resign instead, his attorney said Monday. Kratz, a Republican, had been the top prosecutor in the eastern Wisconsin county since 1992. He had been facing demands for his resignation since The Associated Press reported earlier this month he sent 30 text messages to a domestic abuse victim trying to strike up an affair while he prosecuted her ex-boyfriend on a strangulation charge. In them, the 50-year-old Kratz called the 26-year-old woman a "hot nymph," asked if she was "the kind of girl that likes secret contact with an older married elected DA" and wondered whether her "low self-esteem" was to blame for her lack of interest. Stephanie Van Groll complained to police about the harassment, and Kratz was removed from the case. Lawmakers, the governor, Kratz's peers and victims' advocates were outraged when they learned about the texts. Kratz apologized for his behavior but initially refused to resign, saying the punishment would be too harsh. Doyle recently started a rarely used process to consider removing Kratz from office for cause. Doyle started the process after local residents filed complaints with his office seeking Kratz's removal. One of the complainants, Heather Severson, said she is "absolutely outraged" Kratz did not resign sooner. "I feel like he's put them through enough," she said. "And to drag it on into this process and then to get this point and resign after saying he would not resign, is a little disturbing but we will see what happens." Attorney General J.B. Van Hollen said Kratz's resignation would avoid a costly removal process and save his alleged victims the angst of having to testify. Three groups that advocate for crime victims called Kratz's resignation "an important first step to restore justice and safety for victims in his community." The groups praised Van Groll, who did not immediately return a phone message, for coming forward. "Ms. Van Groll ... had the strength to hold Kratz accountable for his actions," the groups said in a statement. After the text messages to Van Groll became public, an Oklahoma law student told the AP last week she received similar texts in 2008 after Kratz supported her request for a pardon on an old drug charge. A woman complained to Doyle's office that Kratz invited her to a date at an autopsy. And two more crime victims who have stayed anonymous told a local newspaper and a civil rights attorney Kratz acted inappropriately toward them.